This is a subject I am very much feeling my way with. Having been painting pictures for framing for a little while now and looking at a huge swathe of paintings by others I have come up against the issue of hardness or softness of edges. People talk a fair bit about the importance of edges and getting the mix of lost and found edges right, but no one talks a great deal about why this might be so. If you stand before a scene in ordinary light then the edges of everything look pretty crisp. They even look crisp in fog! So why would we like blurry edges in paintings if we don’t have them in real life? Indeed can you think of anything other than a bank of fog that actually has a blurry edge? Some close too things have soft edges such as curved surfaces where one eye sees further round the curve than the other. This incidentally only happens on vertical or nearly so curved surfaces such as a cylinder sitting on its round end. If you rotate the cylinder to lie on its curved surface then the now horizontal edge will be sharp due to out eyes being side by side. The other effect we see in photography is soft focus. Our eyes do it too. This is what is called depth of field. Depending on the light levels if we focus on a nearby object then the distant one will be soft and if we then focus on the distance the nearby object will in turn become blurred. The human eye does a different sort of soft focus in that objects in the centre of out attention will be sharp but those on the peripherally will be soft and ill defined. Try it your self, I am amazed at how amorphous even objects a little off the central axis become. It is a little hard to stop your eyes following your attention and moving! How we actually take in the world is by scanning our surroundings in little darts and jumps called saccades. Our brains are not fast enough to process fast movement, if you try waving your fingers in front of your face you will find that they become blurred quite soon. So the eye moves in sudden jumps and pauses as it picks out information from our surroundings. Yet another aspect of visual definition is specificity, so a tree will not usually be as visually defined as a person. If you did a picture with blurry people and sharp trees then people would find it a little odd. 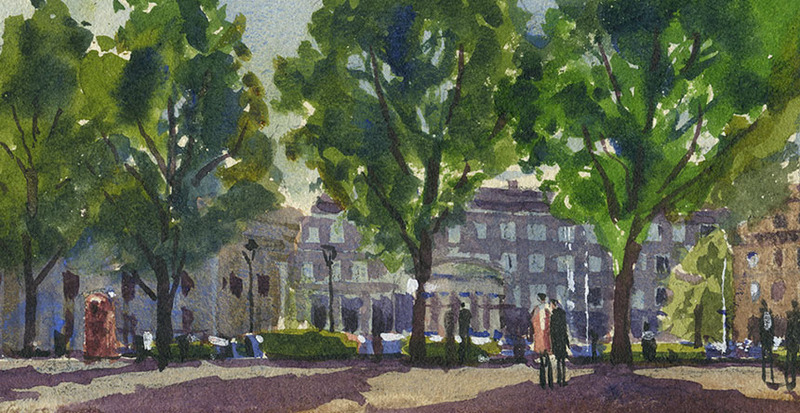 The same painting with blurry trees and defined people would however be quite unremarkable. So as you see we have a quite a few reasons to be blurry in our paintings! This in turn makes softening and hardening of edges quite a powerful tool in the painter’s tool box. When I look at other painters and indeed myself I suspect people learn to use softening of edges in an empirical, this works, that doesn’t manner. Having thought it through a bit I think it might be exploited in quite a few interesting ways. An extra layer of complexity is caused I think due to the fact that the same visual system is being used by the viewer of a painting as the painter. If the trees in a painting are soft then a viewer will appreciate mood and colour but not so much form or botanical detail (painters of course will admire the soft edges but they are just weird!) . The non painting eye will move on to whatever in the picture is more defined but the softer areas will still be supplying mood. It is immediately apparent to me that having things inappropriately over-defined in an area of a picture can be a distraction and weaken the overall impact. I am of course talking about a certain type of picture, the impression of time, place and weather. People tend to confuse the different ways we can read a picture, so a detailed picture is inviting a different sort of looking and appreciation than an impression. They are not I feel better or worse per se. Indeed you could maybe mix the two if you were very clever. Where I need to improve the control of focus is in my oil paintings. With watercolour I tend to use wet edges and so forth automatically, but with oils I have to think it through. Also with watercolours you are often working from the very amorphous to the definite as a matter of course. There it is that is the nature of painting there is always more to learn and deficiencies to make good! Enough complaining, a few drawings and paintings. I am in a quandary with paper at present. Arches, my favourite paper has become very poor in quality of late. I have a couple of rolls which will keep me going a few years in the studio, but for painting en plein air I used the glued blocks. These alas have become very poorly sized as have the single sheets, making the washes dry dull and lifeless. The surface of the paper is not as tough as it should be either so lifting out becomes a risky process. As an experiment I have bought some paper from the Ruscombe Mill in France. They make recreations of historical papers. So I bought a few sheets of David Cox and some Thomas Girtin types. The paper is much lighter in weight than we use now and must be stretched. Also it has more inclusions and is less white. I must admit I was slightly horrified at the uneven surface when I first unpacked it. None the less I stretched up some and took it out. The one above is done on the David Cox. The paper contracts fiercely when stretched so I had to use my Artmate. As always when using a new paper you have to just dive in and I found it hard going at first. It doesn’t react well to wet into wet so washes must be laid cleanly and in one go. The scene above was done in around 45min and could have done with more careful drawing out. Altogether though it has quite a pleasant quality and now I know what it does well I can try and exploit its qualities. The paper is very very tough so lifting out is easy. Its weakness is that washes even when quite concentrated dry a little pale. I did this sitting just by the Tower of London looking towards the city. 10in by 14in. Second one of the day. 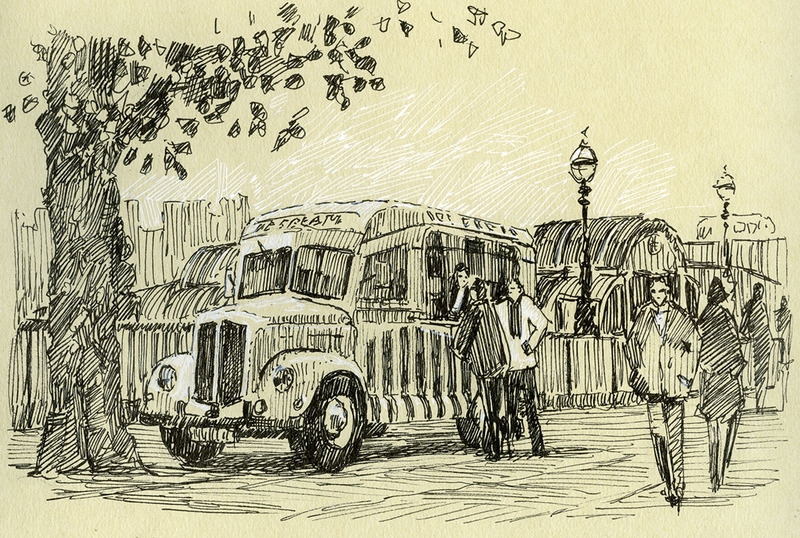 It was a Wapping Group day so I sat near the Dickens Inn at St Katherines Dock. This is the Thomas Girtin paper. It is less white a sort of soft buff colour. Unlike the David Cox it took to wet into wet well as you can see by the softer feel. Also stronger tones were easier to achieve. All in all very pleasant to paint on, I shall be intrigued to try a larger painting as this one is only 5in by 10in. Strong whites will need to be painted in with body colour, which is of course just how Girtin often worked. 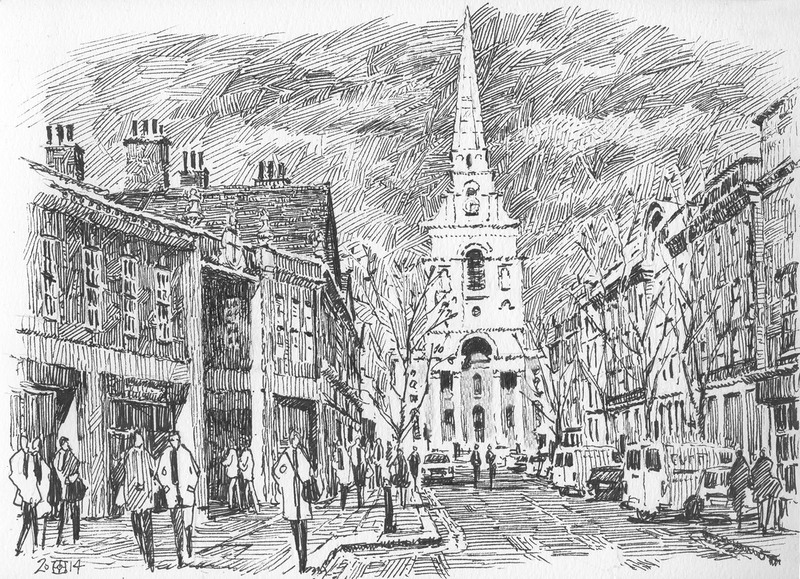 The Brass Monkeys were at Spitalfields. We met at one of the cafes in the Market. 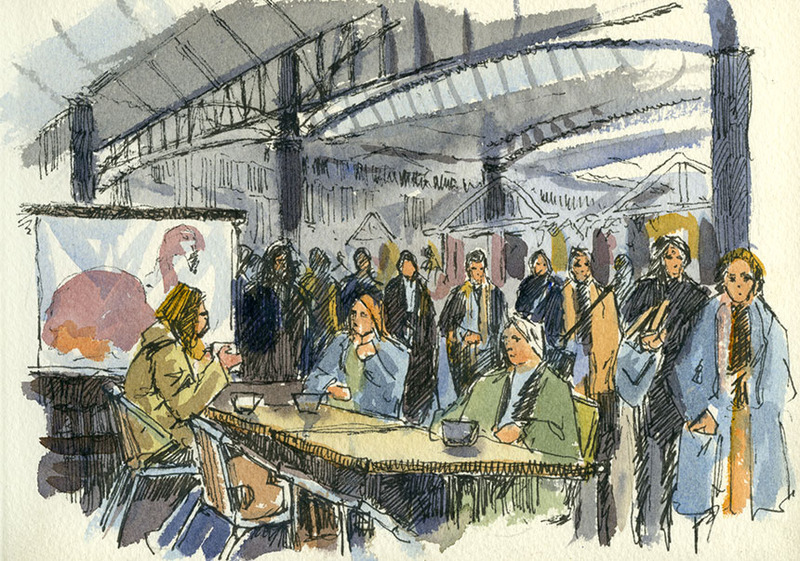 While I drank my coffee and chatted I drew the passers by. I am going to try and add a little more character to the figures in my drawings to make them a little less architecty . Generic figures are OK but ones that tell a bit of a story are better I am beginning to think. 5in by 7in. This is the view down Brush St to Nicholas Hawksmoor’s Christchurch. I had to hatch the sky later as no time to do on site. 7in by 9in. Here generic figures are fine as the church is the star. 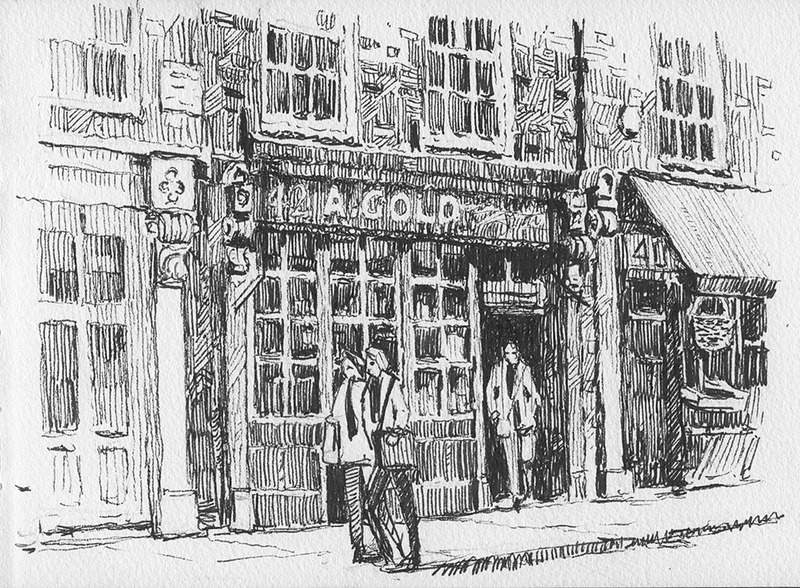 A smaller pen sketch also in Brush St. Here I could have done with some more definitive types of people. 5in by 7in. Sorry, yet more drawing… it is just a way of avoiding the oil paints maybe! Here I struggled to find something to make a picture of and abandoned two at the pencil stage. Then this confident young man walked past plainly on a mission unlike the dawdling tourists. I drew him in first and then built the rest of the picture around him. 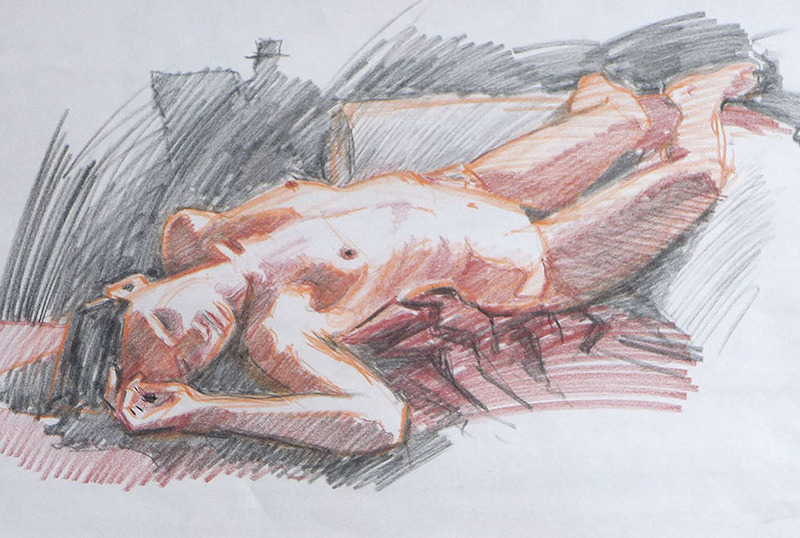 This is also on Ruscombe paper, quite resistant to draw on but gives a nice quality in the final result. This is the South Bank and another day out with the Wappers. 6in by 8in. I am off to Florence for a painting trip so my next move was to go shopping to stock up on pens. I found this odd white pen which allowed hatching on the cream paper. Interesting effect, I shall be using it more. 6in by 8in. 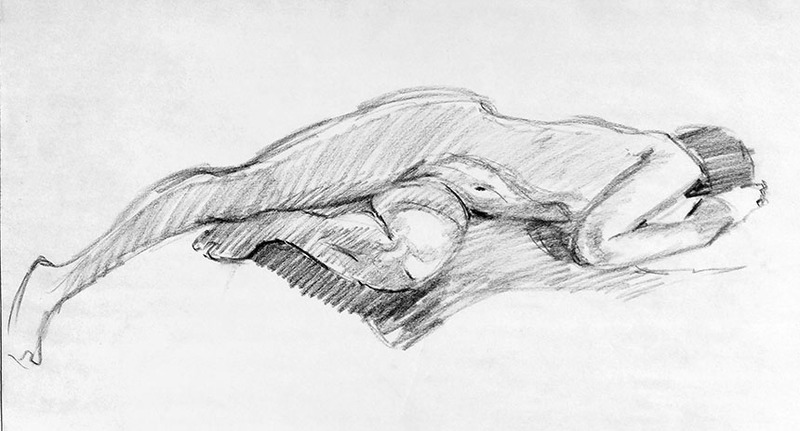 A few life drawings to finish off. I was trying to keep things simple so just black and white. I added red here and regretted it slightly. Having been a commercial artist, illustrator and designer for 35 years or more it was with a certain amount of relief that I gave up most of my paid work. I told myself that I would retire and just paint. I am not hugely wealthy but my career was pretty successful and I am a saver rather than a spender, so painting does not need to bring in large earnings. However as you can see by looking back through this blog I have not exactly settled down to a life of relaxation and leisure. My question to myself is: Why not? Not as easy to answer as you might expect. Yes I love painting. Also the connections and society that comes with swimming with the other intriguing fish in the art pond. It is without doubt the pivot around which my life turns. On the other hand it also is the source of most of my feelings of inadequacy and frustration at vainly groping for seemingly unreachable goals. Painting is after all a banquet of repeated failures garnished with a few sprigs of success that all too quickly wilt. I don’t think I am lured on by success and the possibility of “making it” as a painter. I am a bit old for that I fear! I care not a fig for posterity or whether my work lives on. I have no belief in afterlives so it is only the here and now that matters. I don’t need it as a prop to my identity, indeed I only reluctantly and uncomfortably admit to others I am an artist. It is true a major ingredient in the mixture that comprises and has shaped my “self” has been art and the getting of skills related to it. Much of it of course comes down the unavoidability of being alive. There is no escape from you own thought processes. They even bubble away when you are mostly unconscious at night. We cannot take a sabbatical from living, existence offers no possibility of respite whatsoever. The river of being might flow slowly, churn into rapids or fling itself in a turmoil over falls, but the movement downstream never ceases until it reaches the sea. You must therefore navigate its currents and eddies in your fleshly canoe desperately paddling to avoid rocks and whirlpools or drifting through gentle backwaters. Whatever course your river takes there is no stopping, if your canoe is grounded or you draw it up on the bank there is no relaunching into the stream. All of this is obvious I realise and I do not complain. I don’t wish as eastern thinkers do to stop the flow. It is not possible in any case, you might sit still with little or no mental chatter, but pretending to be merely a stone is just that… pretence and perhaps just another form of vanity. Sticking to the now rather stretched river analogy we each perhaps to a greater and lesser extent follow different flows and cross currents in the general flood. Some might drift in quiet waters near the bank while others toss and churn in the white water. So painting perhaps provides me with a means of navigating the wider stream, a discernible course around which the darts and eddies of the rest of my life can form. In turn this gives me maybe some insight as to the benefits painting brings to the painter. Painting gives you a platform from which you can observe the world. You are looking for pattern and structure both actual and emotional and in looking, breaking down and sorting you gain small insights into more general things. Learning to draw and paint in short supplies the intellect with a glass through which to view things. However once that glass has been put into place all other things are inevitably seen through it. Any learning has the problem that it cannot be unlearned very easily. Having learned what a cat is you can never view the animal as an unknown thing again. This is why the common artistic aim to “see like a child” is rather foolish. If I try I will not see like a child. I will merely illustrate how an adult imagines it might look if they could possibly once again see like one. I don’t want to pretend any other view point other than the one I have. Just attempting to understand who and what is around me is more than enough. So, why bother? Well by looking and striving to set down what I see, I become more perceptive in my particular form of study. I hone my abilities to look and distil meaning from the sensed world. Because I have gone through this process I see things, small wonders, that others might miss. By attempting to paint them there is the occasional chance that others can see for a moment through my eyes and share in that beauty. Indeed, now I think of it, that is exactly what I get from the paintings of others that hit the spot. It also gives me a measure for judging works of so called art. There is a difference from an aesthetically pleasing object to one made with hard won insight and skill. Almost anything can be rewarding to consider and look at. You can look at almost any object and have an aesthetic, educational or meditative experience. These feelings however come from within, the object is just the initial stimulus, a catalyst if you will. A real work of art hopefully lets you see for a moment through another’s eyes, share in another’s perception, stand briefly in a place you could not have arrived at by yourself. The artist has by years of effort mapped the terrain over which they have travelled and set down their findings upon a surface so that others can appreciate and take pleasure in it. To illustrate the divide, take a work that is hailed as high art that I rather like. Anthony Gormley’s “Field” . I saw this in the flesh and that myriad of little eyes staring blankly at you was very effective. It made his name so a success by most measures. It did however not take any particular skill to make. Once given the instructions another just as effective could be made. It is also a one hit wonder, after the initial surprise you just wonder how many hours the whole thing took to make. You essentially get the whole story in a glance and all the impact is made by your own instinctive reaction to being observed by a horde. If you had a small version in your house it would not move you every time you saw it, nor would it reveal any hidden subtleties. Then take a painting by Velasquez. “Las Meninas” The making of this in comparison certainly could not be delegated. To do anything comparable would take a lifetime’s effort and even then be almost certainly doomed to failure. If you hung it in your house it would I think fascinate and reveal a different aspect that you had missed before for years if not a life time. An object is only I feel imbued with this quality through the application of many years of acquired skill and insight. The other thing that distinguishes it from Field are its flaws. There are no errors or miscalculations, no lapses of concentration in “Field”. 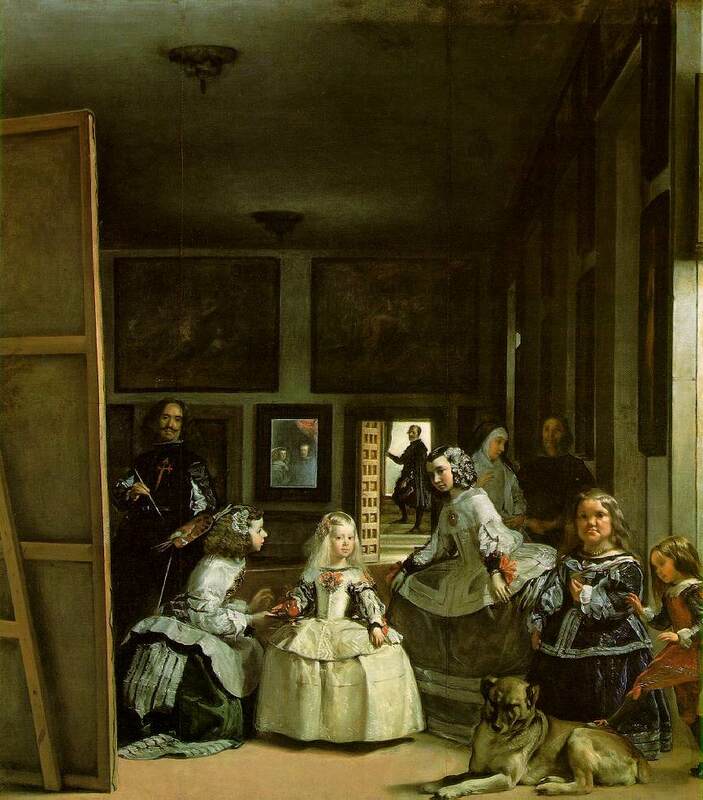 Whereas there are parts of “Las Meninas” where Velasquez plainly falls short. The dog’s head position is unconvincing and the far right figure misjudged and cursory. The lady in waiting to the right of the Infanta has a gaze that is oddly directed. The work has just so many questions it asks but does not answer. Field on the other hand only asks us a simple question about multiple gazes and our reactions to unwavering attention, after the initial jolt there is not to much to be gained from it. Don’t assume I dismiss or dislike it, on the contrary I thought it very good of its kind. However for a work from the hand of a human to be at the absolute peak of possible achievement all aspects need to be present: skill, understanding, learning, dexterity, perceptiveness, intuition and restraint… to name but a few. Gormley has many of these but Velasquez has all of them which is why in my opinion Las Meninas towers above. So,why bother? Well, because it is worthwhile of course! I can only apologise for another dose of art theory… a few pictures to finish off. 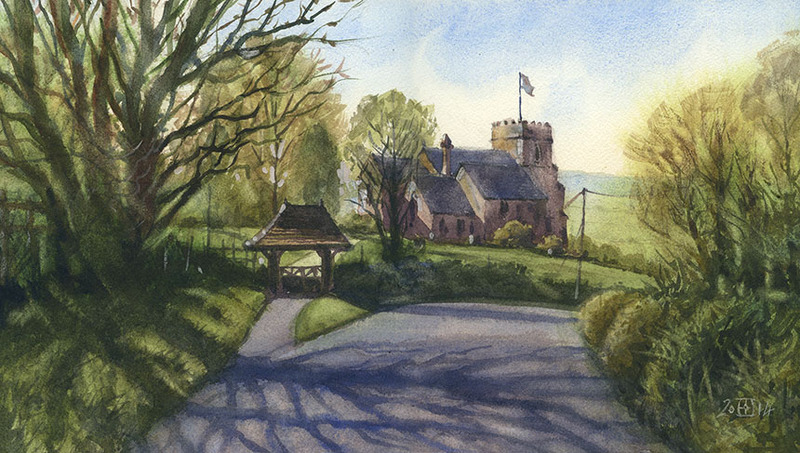 This is Al Saints Church in Kington Magna, parts of which date from Norman times. A great position over looking the Oxford plain. I am considering a figure approaching the lych gate but am wavering. 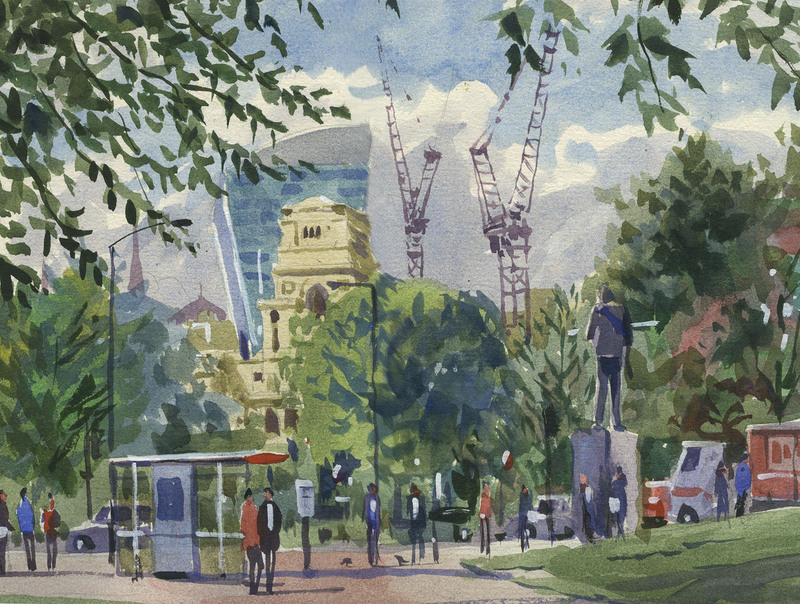 Watercolour 9in by 15in. 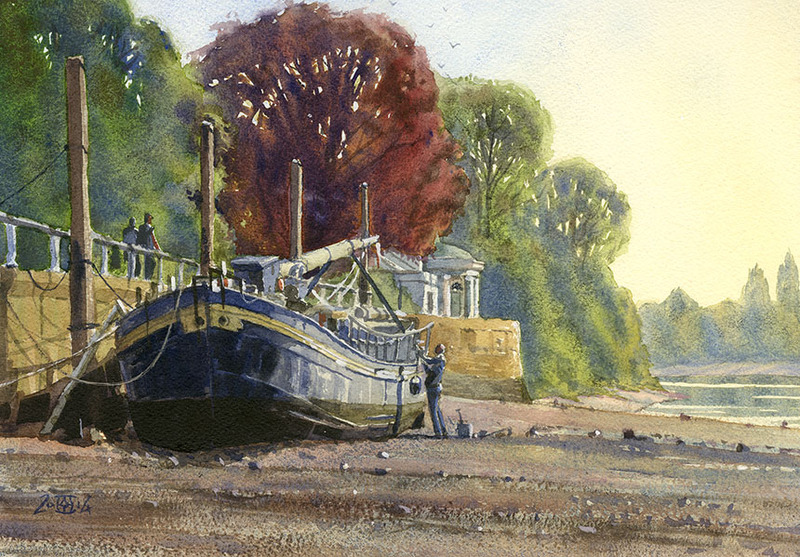 This is a dutch barge hauled up at Isleworth in the early morning. I did a plein air to the left but as the tide retreated this better view came available. A studio picture from reference but the mood and light was taken from the plein air… which by the way I won’t post as it went pear shaped! Not all due to my incompetence though, I was using paper in an Arches block which is just horrible with all the washes drying dull and dead. This was done on purportedly identical paper from a roll. I would dispute this though. Here I lifted out by scrubbing with a bristle brush, on the block paper I attempted to lift out by gently using a sable and the paper surface broke up. I have complained to Canson but they have not replied as yet. 10in by 15in Watercolour. 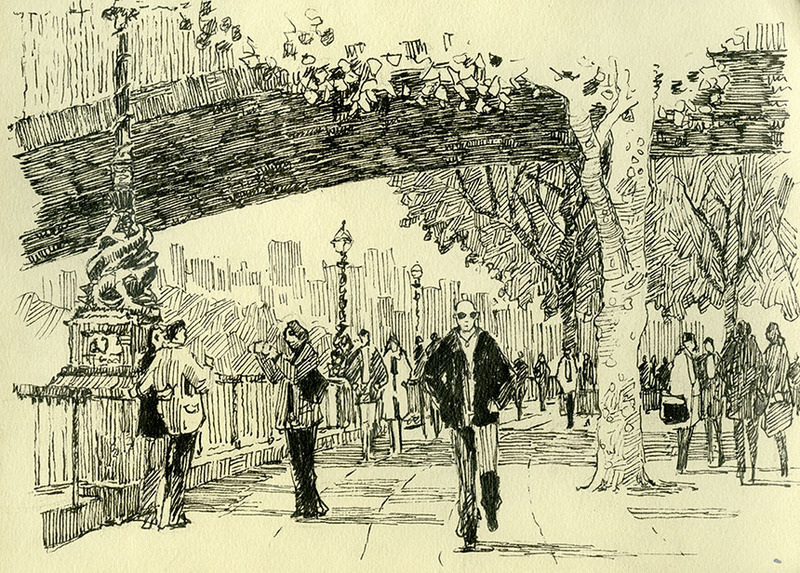 I am hooked on the pen drawing at present. 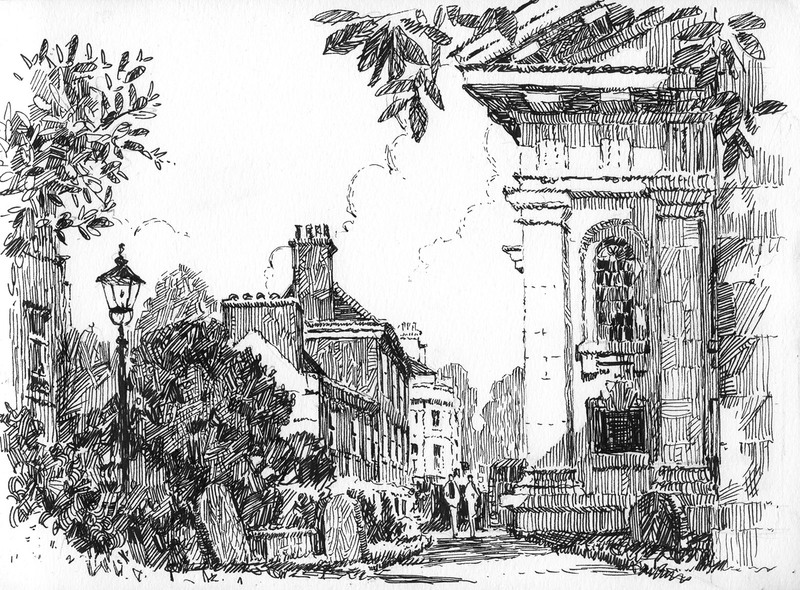 This is St Alfege in Greenwich a peaceful spot the tourists never seem to find. Slightly out of order I did this earlier on the same day. It is great fun to try and get as much information from as few a strokes as possible. 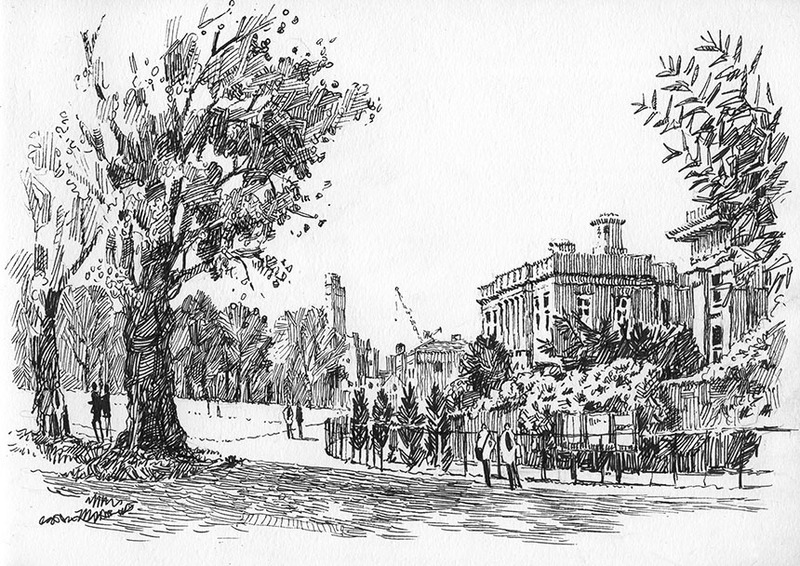 It is of the Queen’s House seen from Greenwich park. Some life work to finish off, I have been chopping and changing which media I use. One with a very small palette and brushed line. It is interesting how variations in media allow you to home in on different aspects of the pose. 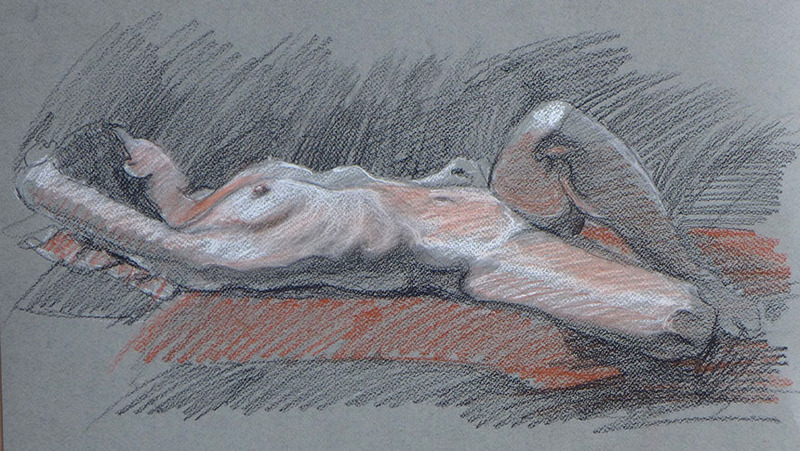 Pastel pencil, so good for expressing the subtle changes of tone. 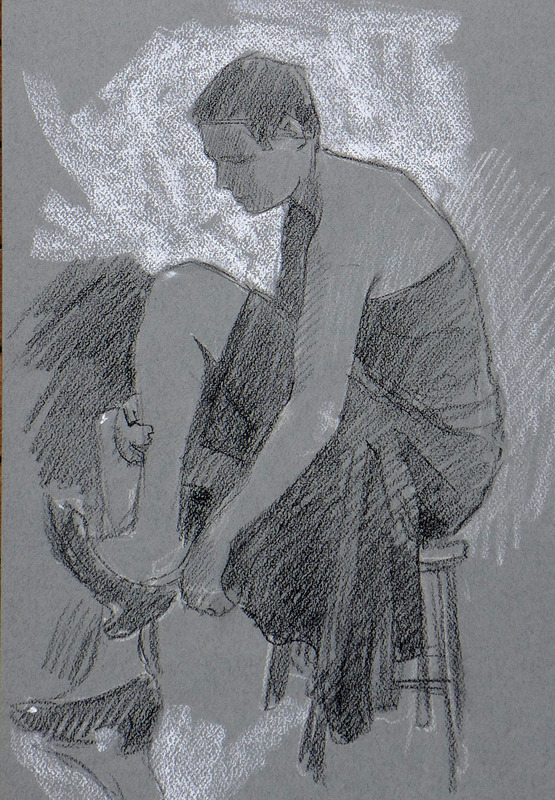 Nice to draw the clothed figure occasionally. I tried to keep this as simple as possible. Lovely light on the torso here, I was very much looking for the terminators between light and dark. Many artists love to accentuate these but I don’t like to over state them. Standing or stretched out poses are always I find the hardest. Due I think to the parts being harder to relate. Lastly a quickie of 7min. If you catch it right these are always my favourites!